Biosphere 2 Project candidates in Biosphere 2. Dr. Roy Walford, the crew physician, is front and center. 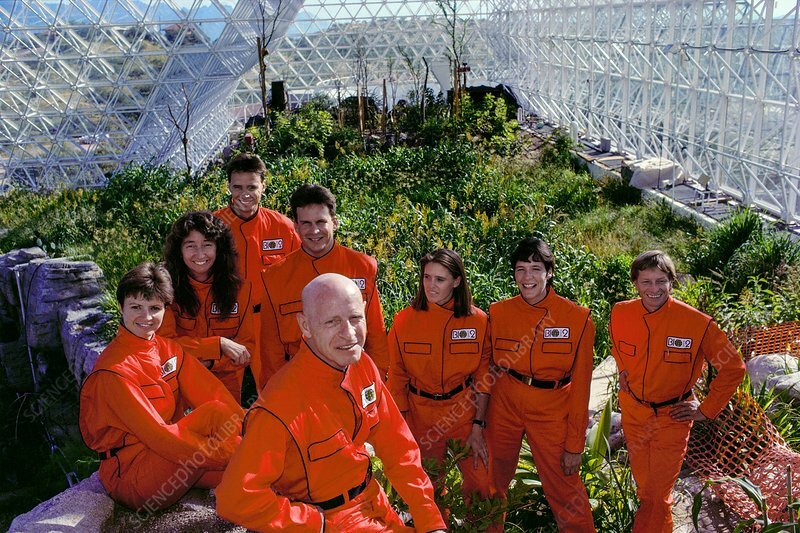 Biosphere 2 was a privately funded experiment, designed to investigate the way in which humans interact with a small self-sufficient ecological environment, and to look at possibilities for future planetary colonization. The 3.1 acre site near Tucson, Arizona, and was entirely self-contained. The eight ‘Biospherians’ shared their air- and water-tight world with 3,800 species of plant and animal life during their two-year isolation experiment. The project had problems with oxygen levels and food supply, and has been criticized over its scientific validity. Photographed in 1989.